No college student likes signing up for a 9:00 a.m. lecture on Monday mornings, but sometimes you just need the credits. It's a simple enough class, and your only real challenge is remaining conscious the entire two hours. The prof just loves calling on students for answers, but you'll be fine as long as you're not passed out when he shouts your name. 6 additional six-sided dice, 1 for each "student"
All players take their seats by placing their die on the corresponding numbered "desks." 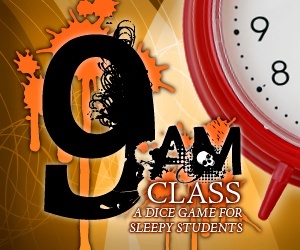 Once seated, all players roll their dice to determine whether they're awake or asleep at the start of class. At 9:00 a.m. (the start of class), all students start with 20 points, or a perfect grade. Are you awake or asleep? A handy primer. The number face-up on your die corresponds to your status, or how conscious you are at that moment. A 6, 5 or 4 means you're awake; your eyes are open and you're ready to be called on. The object of the game is to have the highest grade by the end of class. Each turn represents 10 minutes of class time. The game begins at 9:10. At the beginning of each turn, all players Â¬- except the player called on last turn - re-roll their dice to determine their status for that turn. Someone then rolls the professor die to determine whom the professor calls on to answer a question. The number rolled by the professor corresponds to the students' desks. If the student called on is asleep, he re-rolls to determine the number of points he loses. If the student chooses to make himself look good, he re-rolls his die to determine the number of points added to his score that turn. That number then becomes his status for the following round. If the student chooses to make everyone else look bad, all the other students lose points equal to their current status. A player whose status is "5," for example, will have 5 points subtracted from his score that turn. The scores are recalculated for the number of points lost or gained by each player, and the new scores are recorded in the appropriate 10-minute time slot. The game then moves on to the next turn. Each student is allowed one bathroom break, which must be announced at the beginning of a turn before the professor rolls. This abstains that player from one turn. If the professor rolls that player's number, the professor must re-roll. When the player returns next turn, he rolls for status. After the final turn of the game is played (11:00 a.m.), the scores are calculated, and the student with the highest grade wins. In the event of a two-to-six-way tie, all the students tied for first place take their seats and roll for status. The professor then rolls to call on one of the students. If the student called on is awake, that student wins. If the student called on is asleep, that student is eliminated, all remaining students re-roll, and the process continues until either one student remains or until the professor calls on a student who's awake. Six players not a good number for you? No worries! 9am Class can be played with four, eight, 10, 12 or 20 students! Each student will still need his own six-sided die, and replace the professor's six-sided die with one that accounts for the corresponding number of students. The rest of the game remains the same!